S100 Motorcycle Drying Towel dries your motorcycle in minutes! Stays soft through countless uses. Soaks up water to prevent water spots and drip marks. S100 Motorcycle Drying Towel delivers a spot-free finish on all motorcycle surfaces. This super absorbent synthetic chamois (shammy) safely wipes away all traces of water after you wash your motorcycle. 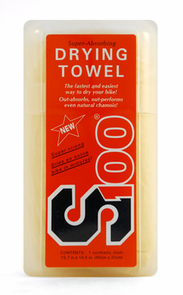 The S100 Motorcycle Drying Towel is uniquely engineered to absorb more water than a cotton towel or natural chamois. 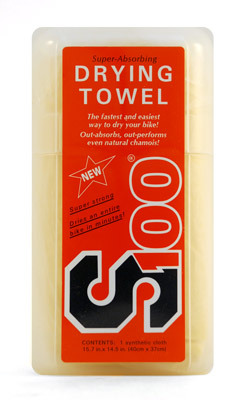 Unlike natural chamois, the S100 Motorcycle Drying Towel does not stiffen. Store it inside its case to retain its amazing properties. The S100 Motorcycle Drying Towel should be kept in your saddlebag to dry off your motorcycle after rain showers. Removing water prevents minerals from depositing on your bike's surfaces. The S100 Motorcycle Drying Towel is 100% biodegradable and no CFC's or formaldehydes are used in its manufacture. I have been buying this product for years from my Harley Dealer. For some reason non of them still cary them so I bought 4 of them online. Best product I have found for drying a bike. Squeeze out the water while drying and the bike looks great! Glad you still make this product. ConsNot available at bike shop anymore.